This unique recording features an assortment of actors reciting Coleridge's most famous works, all gems of English poetry. Acclaimed actor Michael Sheen does a superb and truly harrowing recitation of "The Rime of the Ancient Mariner", while Sarah Woodward is a sensuous Christabel. “Frost at Midnight” is infused with a sense of dark glamor, while “Love” is haunting and profound. Overall, the performers here do an excellent job showcasing the beauty of Coleridge's words and the depths of his emotions. An excellent way to experience the work of this deeply imaginative and inventive poet. 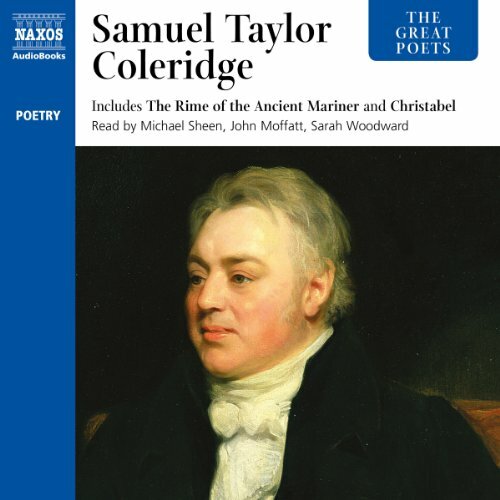 Samuel Taylor Coleridge, in collaboration with his friend, William Wordsworth, revolutionized English poetry. In 1798 they produced their Lyrical Ballads, poems of imagination and reflection using "the language of men" - pointing the way forward for a generation of Romantic poets. Coleridge’s addiction to opium affected his poetic output, and yet the handful of poems he did produce were innovative. These ranged from the quietly conversational to the wildly imagined, and include two of the greatest in English literature: "Kubla Khan" and "The Rime of the Ancient Mariner". Hollywood actor Michael Sheen reads "The Rime of the Ancient Mariner", in this collection, which is part of the Naxos AudioBooks The Great Poets series. This popular anthology also contains Coleridge's other major narrative poem "Christabel", as well as "Kubla Khan", "Love", "Frost at Midnight", and "The Lime-Tree Bower My Prison". S. T. Coleridge was an influential poet of his time. He was one of the founders of the Romantic movement. Being a chronic opium addict, suffering from depression and poor health, he created intense, vivid and emotional imagery. His poetry is gothic, nostalgic, razor-sharp and evocative. The narrators' performance was heartfelt. I first read this poem when I was 14 years old and it has remained my favorite ever since.i carry a pocket book copy in my bag wherever I go, are I have 6 individual books in my home library. If I have one regret with this book they read only his longest pieces, True among them things like The Rime of the ancient mariner. Still I would of liked to hear some of his witty but shorter works. Beyond that it is an excellent introduction to Coleridge. Just dig deeper to really know him. Would you try another book from Samuel Taylor Coleridge and/or the narrators? I was led to believe that I was purchasing a CD; NO! . . It gave me a download which I can't listen to because I'm not a member of this website. Would you ever listen to anything by Samuel Taylor Coleridge again? If you could play editor, what scene or scenes would you have cut from The Great Poets: Samuel Taylor Coleridge? To be honest, my reading experience was definitely affected by the fact that many of the narrators seemed to read the poetry in their grammar school voices. You could virtually hear the lungs being expanded to bursting point in order to make the requisite explosive 'Oh!'. Coleridge is a poet very much of his time and now his 'simple expression' and the extasy provided by nature seems either contrived or tame. It is hard to imagine him as a controversial figure or writer. Personally, I find a great deal of solace in nature and I feel spiritually energinsed by isolation, so I do enjoy many of Coleridge's flights of the sublime. However, I am not a devotee of the tone of many of his poems. His inverted snobbery and occasional pomposity smacks too much of the bitterness of having to rely on patronage rather than being born to completely independent means. He reminds me of a second home owner who claims to be 'local' and desperately wants to be accepted by the yokels despite depending on Waitrose home delivery and asking what 'craft' ale the local pub serves.